Our announcement a couple months ago that we had decided to order a Teardrop Trailer was a long time in the making. We started looking, researching and testing teardrops a little over 3 years ago. Now that we have committed to the purchase from TC Teardrops, we have a lot of decisions to make about how we want our build to go. We’ve had to take a close look at how we like to travel, camp and spend time outdoors together. Realistically, we could make do with the bare minimum…realistically, we could make do with no trailer at all…but going forward we know some things would make travel a little easier, offer greater options and allow us to comfortably spend more time on the road. And that, really, is the whole goal. Our decisions have been based around the kind of travel we like and what we like to do when we get there. We like to spend our time outdoors so interior options are pretty minimal and we don’t normally cook elaborate meals so the galley could be pretty straight forward. We are more concerned with being able to get it where we want to go, making sure it is secure and offering us power and storage options for our toys and gadgets (gotta keep writing and taking pictures!). We also had to keep the bottom line in mind while sorting through the options. One of the road blocks we faced initially looking at other teardrop companies was price. We have a number in mind that we set as our ceiling and many of our decisions have been colored by this limitation. In an effort to answer some of the questions about what we ordered and why we chose the options we did, here is the breakdown of our build order from TC Teardrops. 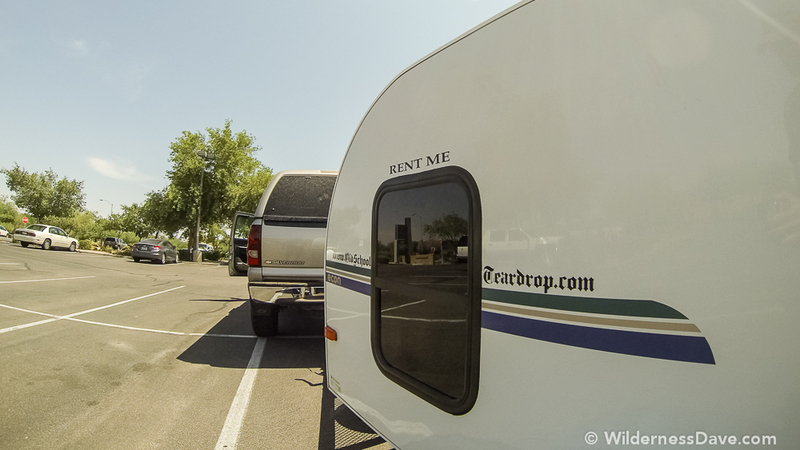 There are several base options from TC Teardrops for their trailers. They offer a 4×8, 5×8, 5×9 and 5×10 base trailer size and everything else is built off of this. So our first decision hurdle was deciding on the size of our build. We really wanted to keep the trailer as small as possible, while still being functional for the two of us, our two dogs and some of the base gear we already travel with. We knew the 4×8 was going to be too small…no question. We initially got quotes on the 5×8 figuring there was plenty of room for us and we could make do. However, once we really started looking at the specs we ran into an issue with the size of the galley in the 5×8. At 17.5″ deep it was going to be a really tight fit to get our 50 quart cooler from Canyon Coolers in the space. 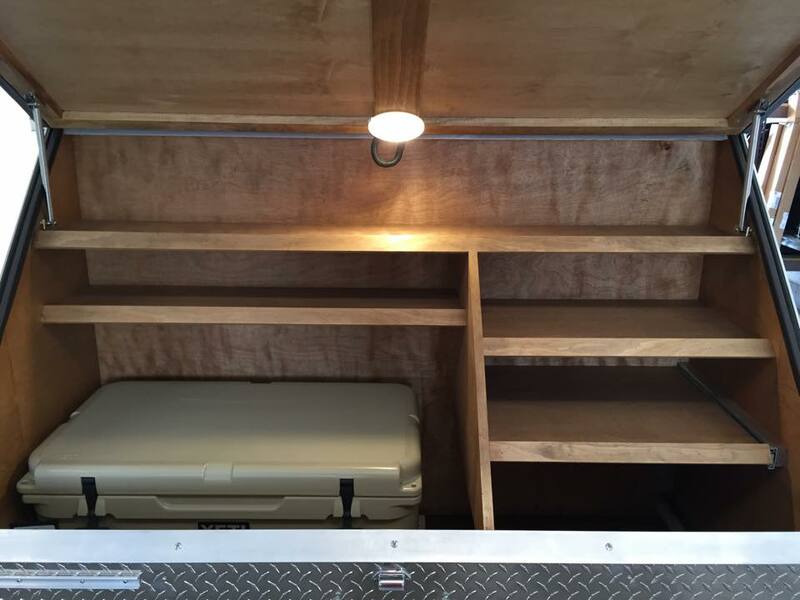 The galley on the 5×9 is a roomy 25″ deep and would fit our cooler with plenty of room to spare. The 5×9 also offer additional room in the cabin so I would feel like a sardine. Surprisingly, color was the one thing we struggled with the most. It’s easy to pick a color when buying something already built and ready for purchase. Picking a custom color from such a large selection had us debating, oscillating, comparing and (sometimes) arguing. In the end, we settled on a pretty neutral gray/silver color that would allow us to make some decorative modifications later without too much trouble. I wanted something up front for storage with a little more security and protection from the elements. And since we would have room for our cooler in the galley, we could upgrade to the 60″ waterproof diamond-plate lockable toolbox up front as for storage. This will house the battery and allow us to lock up a few odds and ends that otherwise might be difficult to store. We talked about doing a full-on off-road package on the teardrop but the more we talked about it the more it seemed unnecessary. For the most part, we wouldn’t be hauling the teardrop places our Subaru Outback couldn’t go so we were more concerned with ground clearance than “off-road” capability. The “Ground Clearance Package” offered by TC Teardrops includes a couple extra inches of clearance with an upgrade to 15″ wheels/tires and a 25 degree 2200 lb torsion axle. We also upgraded the spare to match (of course). Budget also played a roll here, if we were not worried about the total cost we might have elected for the off-road package just because. The price difference was about $1000. They also have different fender options. My wife and I disagreed on what would visually be better but I won out for practical reasons. I wanted the squared off Jeep style fenders mainly because it creates a small “shelf” when parked and adds some utility. I also felt they’d be a little easier to wrench back into shape if we were to bump into something or someone bump into us. The base package does not come with a mattress, allowing you use your own or opt to save a little weight with an air mattress or sleeping pads. We decided to have them include a Verlo Queen size mattress and mattress cover that would permanently live in the teardrop trailer. A little more comfort for us and a little less hassle when packing up for a trip. It also offers a little more insulation to an exposure through the floor. We have a roof rack on our Outback, so we almost didn’t opt for the roof rack on the trailer. But from a utility standpoint, it’s a good idea. If we set camp somewhere and take off in the Subaru, we may not want to haul kayaks, paddleboards or bikes with us everywhere. 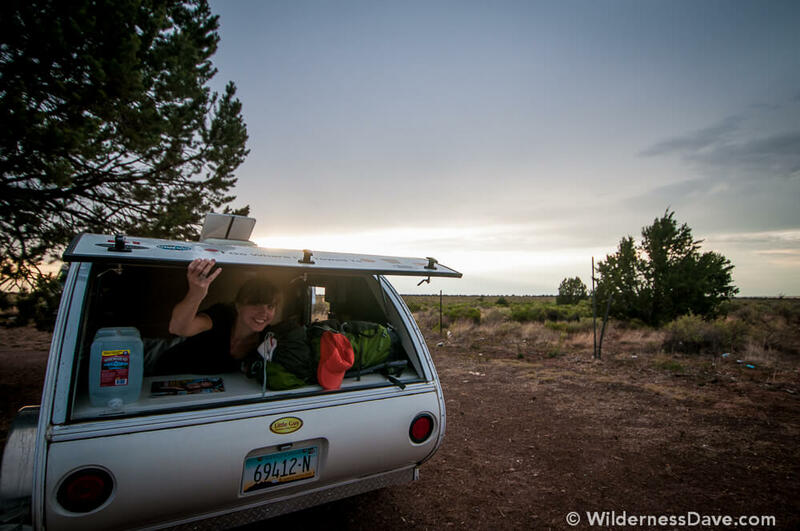 It might be more convenient to leave them strapped (and locked) onto the teardrop. Plus, any roof accessories we would want would require a roof rack and, as it turned out, we did end up adding a couple things. 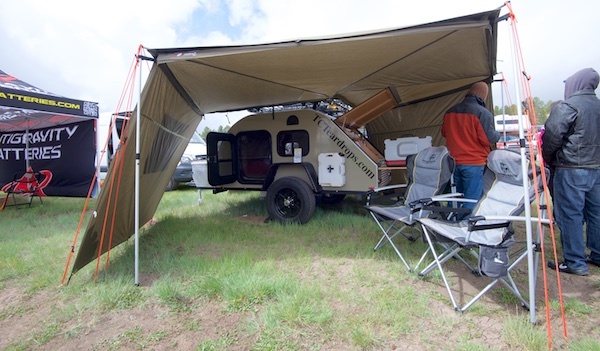 TC Teardrops offers the Foxwing Awning System which, when deployed, provides 270 degrees of coverage around the side of the trailer it’s mounted on. It’s quick and easy to set up and when folded in, it is surprisingly compact. Having the built in shade options, especially for trips here in the desert, saves us from lugging clunky pop-ups or rigging tarps to nearby trees. The trailers are all pre-wired for 12V power. The included LED lights run off of a 12V battery that we’ll supply when the trailer gets here. We also had them include a 15W solar panel to keep the battery charged up. We asked them if we could get a couple of USB accessory charging ports in the cabin and had them include the 110V Shore Power outlets in the galley for when we have the ability to plug in somewhere. To finish off the interior we selected their Honey Maple finish color and had them add Sunbrella fabric “cabinet doors” to the interior storage shelf. For ventilation and comfort we are having them add the zippered screen doors and a 12V directional ceiling fan to supplement whatever air we get from the included side vents and windows. Most of the other interior modifications we have in mind, we’ll do ourselves. Storage solutions and decorative decisions inside we’ll customize as we go based on use and need. Our teardrop will also have a 2″ receiver hitch with a 75lb limit for additional storage or rack options (if needed). We asked to include the small prep table for the galley area. 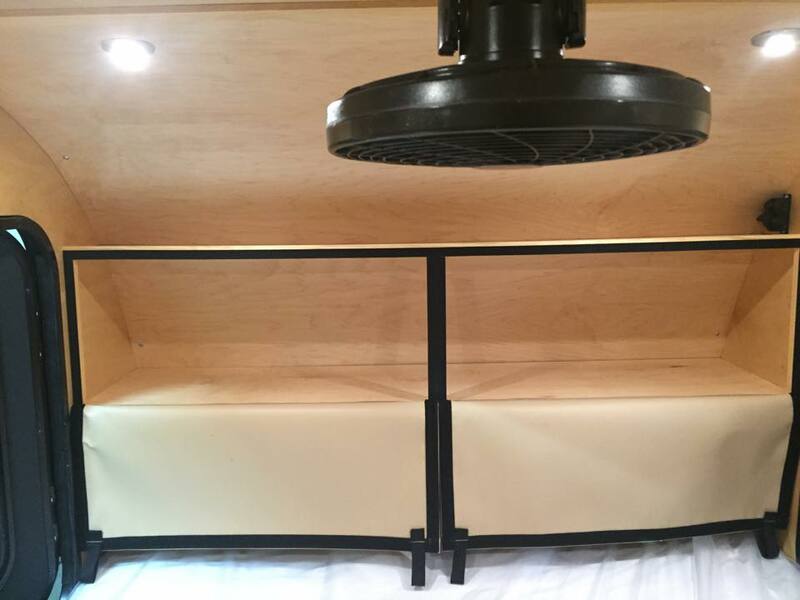 We also asked about getting a custom made storage cover for the trailer since ours will end up having to spend time exposed to the elements when not in use. We are still debating getting a custom vinyl graphic done for the back lid (galley cover) but at this point I think we’re leaning away from it. Like choosing a color, trying to pick out or design a graphic for the back will likely cause more problems than it’s worth. Putting this all together has been fun and Carol at TC Teardrops has been very patient with our order changes, revisions and questions. The closer our build date gets, the more excited we are about getting our trailer and putting it to use on the road. Time might be tight for a while, but we’re already talking about doing a cross-country trip with our new trailer next year. We can’t wait to add #TeardropAdventures to our social stream. Have any questions about our trailer build, or the options we chose, feel free to drop us a comment. Any questions about TC Teardrops, their process or pricing go to TC Teardrops.com or email Carol. Thanks to TC Teardrops for use of some of their photos. Click here for an update on how things are going with the trailer now that we have been using it a while. Two years ago today my wife and I were setting out to spend our first night of her birthday trip to Grand Canyon in a rented Teardrop Trailer. It was a small, bare-bones Little Guy trailer rented from a local guy who is no longer in business. The trip lasted 6 days and we had plenty of time with the teardrop to determine that we wanted one. We’ve done plenty of camping together, sleeping in the car, sleeping in tents and couch surfing but we had just come back from a weekend at Overland Expo and the Teardrops had sparked our interest. We have looked at dozens of different trailer configurations and designs, some more “classic teardrop” than others. All had pros and cons that we discussed at length. Like, unreasonable amounts of conversation about this…you have no idea. Domestic travel in the US has increased significantly in the last 5 years so it’s no surprise that campers, trailers and RVs are selling like crazy. 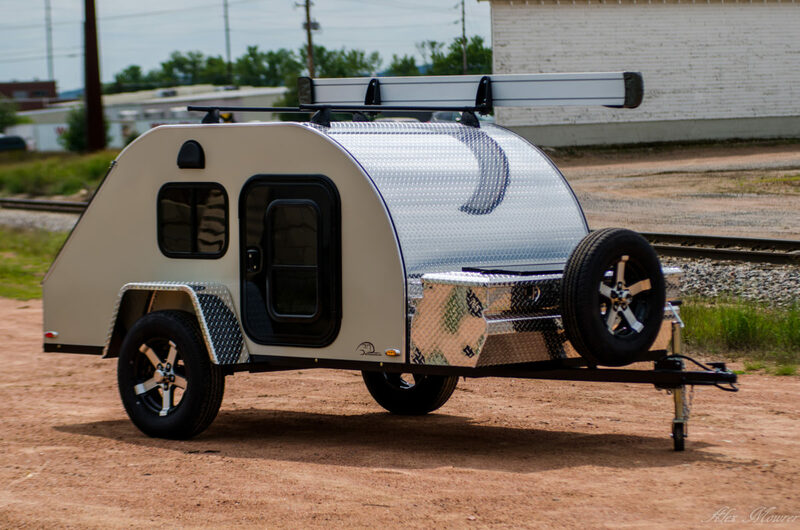 Teardrop Trailers seem to be especially popular with their compact, efficient, lightweight design and nostalgic throw-back sensibility. With barely enough room for sleep space and storage, the teardrops encourage “outside camping” unlike the larger trailers with couches, chairs and TVs. The teardrop is a nice, seamless bridge between car camping RV camping. It suits our style of travel. Two years ago the process started. The idea was seeded in our imaginations and we fostered it diligently, letting it blossom into determination. 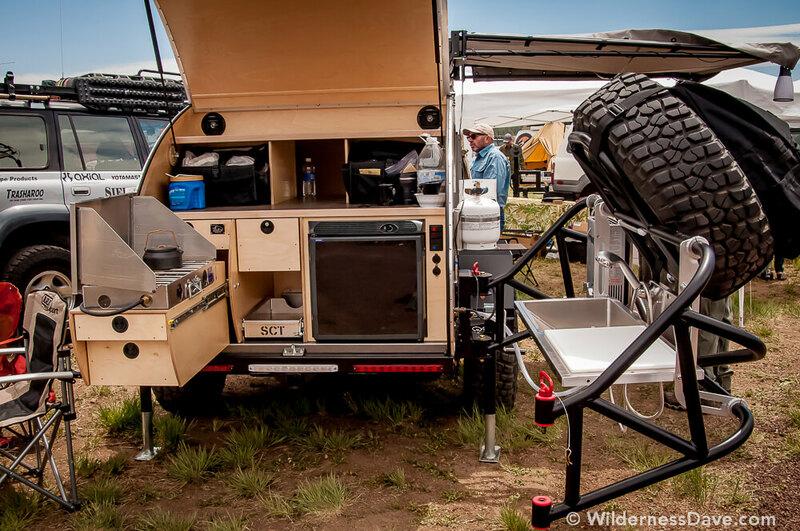 This May we spent a cold, soggy, muddy weekend at Overland Expo West meeting folks and checking out the newest Teardrops and compact trailers for more ideas and inspiration. The unseasonably cold weather and ankle deep mud turned some folks away as the Expo pushed on. Vendors huddled under their canopies and fought back the mud and rain to engage with the thinning crowd of outdoorsmen and travel enthusiasts. On our second or third pass through the vendors (likely on our way to get coffee) my wife spotted a teardrop vendor we hadn’t met yet and we stopped to say hi. TC Teardrops had made the trek all the way from Wisconsin to show their products at Overland Expo West. They’ve been hand-building custom teardrop trailers since 2008 in a small shop in Wausau. Each teardrop is made to order, though they do occasionally have pre-loaded trailers for sale. The trailer we got to see at the Expo was nice, appeared to be well made, had all the amenities we had been looking for and none of the excessive stuff we didn’t need. It’s not the biggest, baddest trailer in town but it’s no bare-bones weakling either. The more we looked, the more we thought this might be a good option to consider so we asked about pricing. With base models starting out around $5k they are very reasonable and allow you to customize your way into something to fit almost any budget. We left the Expo and my wife started doing her research. Today, we put a down payment on our new Teardrop. TC Teardrops should fit us into one of their build slots later this year. I hope to keep everyone updated on the progress of the build, the options we chose and why. We are really excited about this new move. The trailer should allow us greater travel freedom and the ability/desire to extend our trips. 2016 will be the Year of the Teardrop. The Wilderness Wife and I like to travel. We talk a lot about trips we’d like to take and places we’d like to see. I like to run pretty lean when it’s just me, but the wife likes just a little creature comfort when we’re out road-tripping and camping for multiple days. A few years ago we saw a couple pull into a camp ground hauling a small teardrop trailer from T@B. That began our obsession with teardrop trailers. This past May we took a few days off and drove to the Overland Expo outside of Flagstaff, mostly to see friends, but with the secondary motive of checking out the trailer options for overlanding. The Expo proved fruitful and we came home with a stack of brochures for all the trailer and gear options. There were a few stand-outs that we really liked. We looked around and saw a few others, most of which just didn’t fit us. Then we found the setup from So-Cal Teardrops and really liked what we saw. These teardrops were pretty sweet and have a TON of optional upgrades (more than we could ever afford). 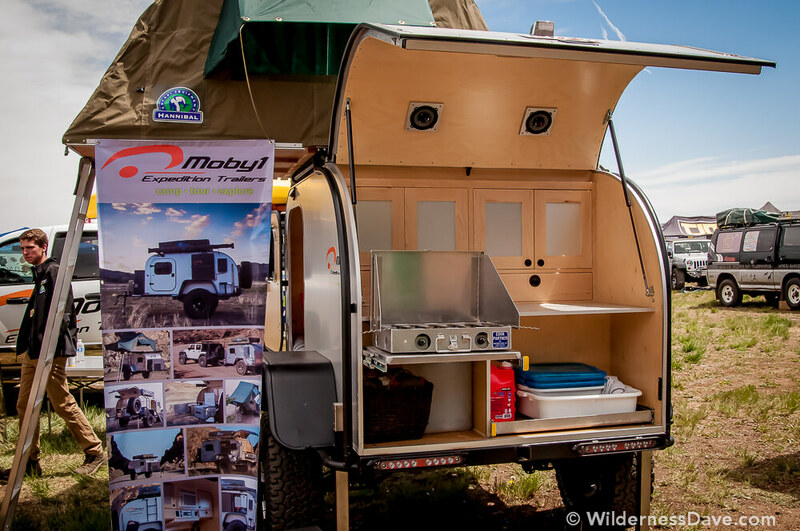 They fit most of what we were looking for – off-road capability, solar options, water storage and pumping options, kitchen setup, optional bike racks, awnings, etc. As with most of this kind of equipment, there is some sticker shock when you start asking. Even so, we had the bug after the expo and just couldn’t let it go. The wife was shopping for used trailers looking for deals. I wasn’t sure if she’d really be as comfortable as she thought in one of these. I mean, they look like they could be stuffy and cramped…it’s a tin can in the desert, what’s comfortable about that? So we had to try one. That was that. When my foot injury kept me from flying off to California to tough out two weeks on the JMT, we decided to spend her birthday camping. 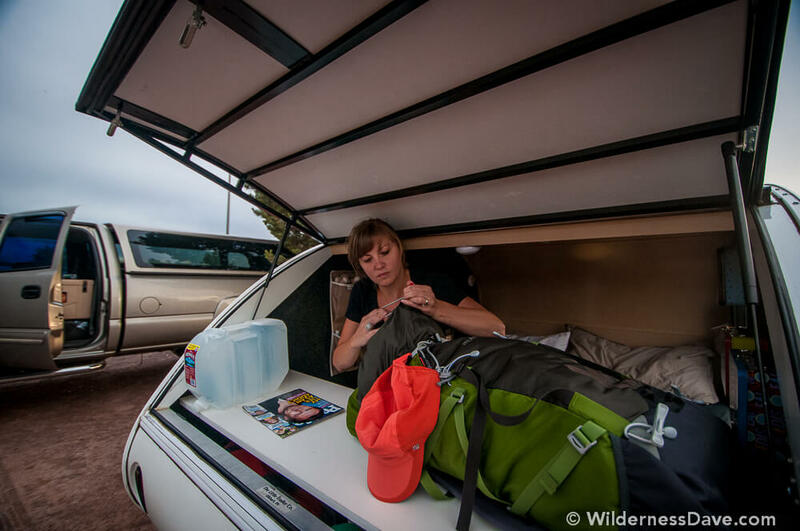 We settled on the Grand Canyon and it seemed like the perfect opportunity to try out a teardrop trailer and see if it was something we really thought we would use. Luckily, she found a local outfit renting Little Guy Trailers under the name Old School Teardrop (they no longer exist). I contacted Old School Teardrop via email after checking out their site and Facebook Page. The wife had pretty much decided already that she wanted to try to rent one from them if it was available…and it was her birthday so I had to see what I could do. Jose, the owner of Old School Teardrop, got back to me and we slowly hammered out the details via email. Jose was very accommodating and actually let us pick the trailer up the night before our rental so we could get an early start with it. He has two trailers he rents out and has plans to get another one. Both trailers are kept very clean and he has rules against allowing pets or smokers use the trailers. My giant truck barely knew the trailer was there. The one we rented was pretty light weight and stripped down. Jose had it outfitted with a bed, storage pockets on one wall and a set of old-school metal lunchboxes on the other wall for storage (pretty cool!). We got the trailer up north and made our first night’s stop at Bedrock City. The trailer was still holding some of the heat from the valley and took a while to cool off inside. Even with the roof vent wide open, the two side windows open and the back left wide open all night it was still a little stuffy until about 4 in the morning. After that first night though, it stayed cooler and was much more comfortable. 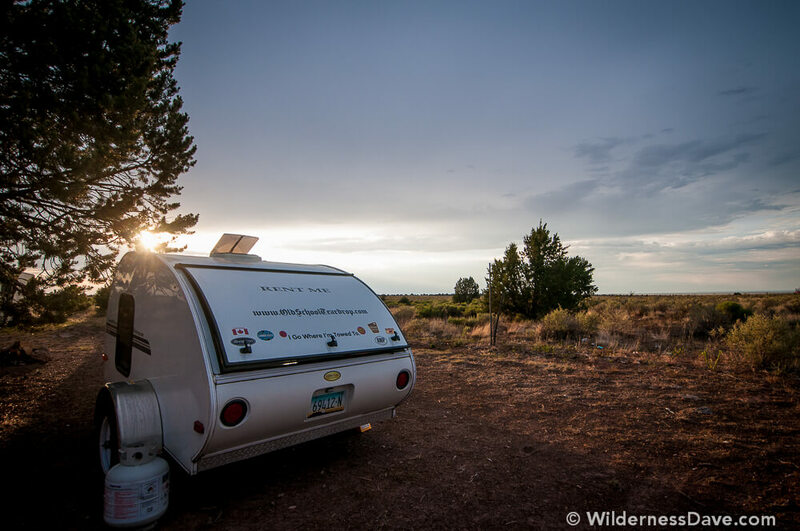 We spent three more nights camping at the Desert View Campground in Grand Canyon National Park. The trailer gave us a nice spot to chill out, nap, crash at night, change clothes in privacy and a secure place to stash our stuff while we were out exploring. The most important part: After 4 days on the road and camping the wife was not ready to go home! WIN! Four days in and she was ready to keep going and a lot of that had to do with the trailer. So, it sounds like a trailer of some kind is in our future. It’s just a matter of figuring out what we can afford vs. what we need to make it worth while. Renting the trailer was a great learning experience and gave us a lot of information to work with in making a decision. I also think Old School Teardrop will continue to be a great resource for us until we find one of our own. Jose seemed pretty excited about having Wilderness Dave take one of his trailers out. We’ve already talked about renting one again for an extended trip out to Joshua Tree National Park in the near future. When I mentioned online that we had rented a teardrop for our trip I had a TON of responses from people on Twitter, Facebook and Instagram asking about the trailer and what I thought of it. The teardrops seem to be really popular right now. If anyone has any questions about the trailer or our experience that I didn’t cover here, just hit me up in the comments and I’ll do my best to answer. 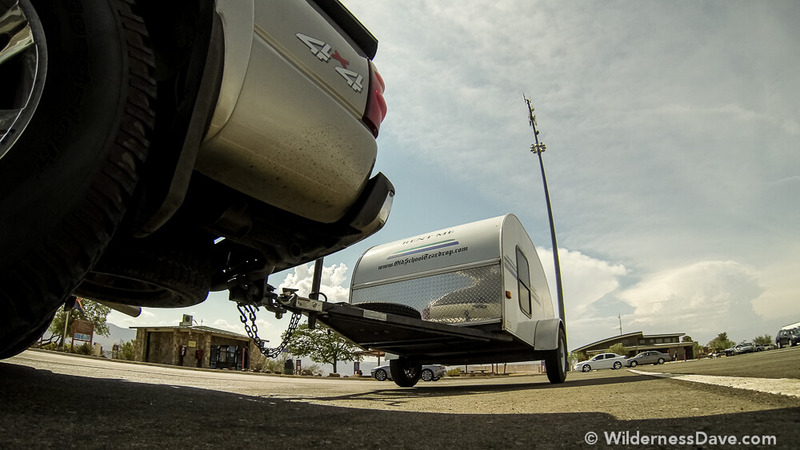 UPDATE 2015: We have made our decision to get a Teardrop Trailer. We are having one built to our specifications and should have it by the end of the year. Read more about our Teardrop decision here. And check out our builder TCTeardrops.